Since his highly acclaimed Royal Festival Hall concerto debut before a capacity audience, London-born pianist LOUIS DEMETRIUS ALVANIS has established an international career and a reputation as a musician of outstanding brilliance and sensitivity, performing in Europe, the USA, the Far East and in the UK; in London he has played solo recitals in the major concert halls such as the Queen Elizabeth Hall, Fairfield Halls, St Johns Smith Square, Wigmore Hall and Barbican Hall. Alvanis is a regular guest at many prestigious international festivals and venues, amongst which the Societa del Quartetto Italy, Toyota Concert Hall Japan, Tarpon Springs Performing Arts Center and Museum of Fine Arts St.Petesburg USA, Sligo Arts Festival Ireland, Windsor Festival England, National Concert Hall Celebrity Recital Series Dublin, Saint-Amand Montrond Festival in France, Bern Casino in Switzerland, Santo Stefano Festival Bologna, Musikseminar in Hamburg, Martinu Concert Hall for Trutnov European Musical Summer Festival, Josef Suk Spring Festival and Bystrice pod Hostynem Festival Czech Republic, Pharos Trust Concert Series Cyprus, Alba Music Festival and Villa Carlotta Concert Series on Lake Como in Italy. He has appeared in Poland on many occasions; at the Powsin International Piano Festival, Staszic Palace, Chopin’s birthplace in Zelazowa Wola, Ostrogski Palace, and open air all-Chopin recitals under the Chopin Monument at the Lazienki Park in Warsaw, in addition to regular recitals for the Chopin Society in London. 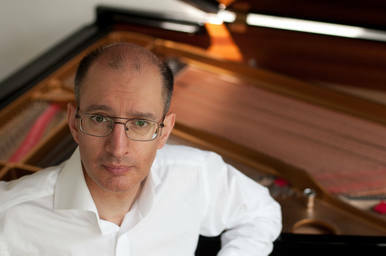 He has performed with many international soloists and ensembles, such as Kyung-Wha Chung, the Aviv Quartet, Ayako Yoshida, and with orchestras including the Royal Philharmonic Orchestra, London Mozart Players, Bern Symphony Orchestra, LSSO, Aikoros Chamber Orchestra, YMSO, Cyprus State Orchestra, Moldova National Philharmonic, Polish Chamber Philharmonic, Prague Philharmonic Collegium, Florence Chamber Orchestra, with conductors such as Fabio Marco Brunelli, Wojciech Rajski, Marios Papadopoulos, James Blair, Poul Jorgensen and Peter Maag. Louis Demetrius Alvanis began his early studies with his father Donis Alvanis. He gave his first public performance at the South Bank Centre's Purcell Room when he was nine years old whilst studying with the Leschetizky disciple Rose Inlander-Gover. He later played to Nadia Boulanger at Fontainebleau where he attended her masterclasses. At sixteen he was admitted to the Royal Academy of Music in London and completed his studies there winning top prizes in piano and composition. Within a substantial repertoire, he also encompasses frequent performances of works by contemporary composers which he has commissioned or premiered. He has also given recitals and masterclasses at most of the UK’s principal conservatoires and universities. His playing has been broadcast by the BBC, ITV (Thames), Classic FM, NTV Japan, Polish Television and Radio, Swiss Television, French Radio, Netherlands Radio, ERT, CBC (Greece and Cyprus) and Radio New Zealand amongst many others, in addition to recitals at the Queen’s House, Greenwich and St John’s Smith Square, both of which were recorded live by Classic FM. A documentary about his work has also been broadcast on the Cable Television network. He is a recipient of the Hellenic Foundation Arts Award and more recently appeared on the front cover of International Piano Magazine as featured artist. The Daily Telegraph critic described his playing as "a truly astonishing fire and force" whilst the Evening Standard reviewer wrote "Amid shimmering right hand chords, Alvanis picked out essential melodic lines and daubed them onto the evening, like a graffiti artist out on a spraying spree. His touch was magical. The music swelled powerfully and the piano roared... the sound is with me still”. His recordings appear on the Meridian and Brilliant Classics labels, and comprise piano music by Brahms , Schumann and Chopin as well as “Piano Colours”, a CD featuring piano music by contemporary British composer Jonathan FeBland. His CD recording for Meridian featuring Brahms Hungarian Dances Nos 11-21 was rated excellent for performance and sound by BBC Music Magazine:“ the dances cry out for sensitive, expressive, witty rubato and precisely judged tempo changes, and he provides these admirably as if he’d spent his life as a gypsy fiddler. He also brings to bear an impressive range of keyboard colour...Alvanis’s poetry and plasticity of line are much to be prized”. International Piano magazine remarked “he produces some magical sonorities that match exactly the celestial quality of Brahms's inspiration”. Earlier this year, Meridian released his recording of Chopin’s Three Piano Sonatas, about which Fanfare Magazine, wrote: “this is playing of a gifted and greatly cultivated Chopin pianist”, whilst Music Web wrote: “this is a very fine Chopin disc and can hold its own amongst the best". He resides in London with his wife Lidia and their fifteen year old triplet boys. Louis Demetrius Alvanis is a Steinway Artist.